We would love to hear your thoughts about this event! We use these feedback surveys to get an idea of the community’s thoughts in order to make adjustments to future events. Thank you in advance if you choose to help us out! For every 20 survey submissions we receive, we will be raffling off 1 random prize shop item from the event! In order to be eligible for the raffle, please be sure to include your username on your survey form. Of course, you are more than welcome to remain anonymous if that is your preference. This survey will remain open until the prize shop closes at 23:59 ST on November 18th, and the results will be compiled and summarized shortly thereafter, with the raffle soon to follow. If you participated in our event activities Bruc’s Mushroom Rottery or Jessamyn’s Spellweaving don’t forget to fill out those submission + feedback forms (forms are located in the first posts of the activities)! If you did not leave feedback about the activities in those forms but wish to, feel free to include your activity feedback in this survey in the general feedback question. The activity Enchanting Expressions does not have a submission form because we are able to collect data on that automatically, and you are also free to leave feedback about that one in the general section of this feedback form. Submitted! Thanks so much for the fun event! Your response has been recorded. ^,^ thank you so much for the fun event!! I love the clicky events! I forgot to add in the additional comments, I hope it’s ok to post here! I really enjoy and appreciate that the events like this can be done entirely from mobile devices. Sometimes activities in other ones simply don’t work and it’s frustrating since I have little computer access. Thank you for the banner. I also didn’t realize there were separate forms for Bruc and Jessamyn’s activity. Three different forms (linked on three different forums) was a little confusing, too, but I managed to get there in the end lol. The auto-buy has been completed! Leftover token raffle prizes have been distributed! Enchanting Expressions prizes have been distributed! Jessamyn’s prizes have been distributed! Bruc’s prizes have been distributed! Feedback raffle prizes have been distributed! I have to say I like the notifications saying what activity they are from!!! Ty glitch! I must say, I’m disappointed that there’s an auto-buy mechanic in place. I had something like 59 total tokens and now i just have a few tickets left and an unwanted bag :/ Perhaps with the next event like this, there can be an opt out option for the auto-buy? 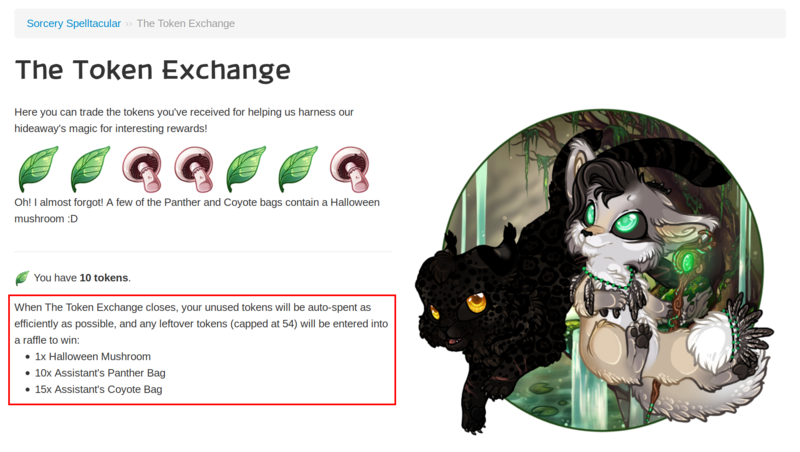 I’m glad it was helpful for the Enchanting Expressions prizes :) Now I feel like a poop for not having support for that with Bruc / Jessamyn >> but I can try to have that in place for next time! In total, we had 156 responses to our feedback survey for this event (about half of players that participated in the event). The majority of respondents, 62%, felt that the event’s duration was appropriate (rated as a 3), with the majority of the remaining responses, 30%, indicating the event was a bit too short (rated as a 2). 59% of respondents felt the amount of effort to earn event prizes was appropriate (rated as a 3), with most of the other respondents rating it as a bit too much effort (30%, rating of 4) or way too much effort (8%, rating of 5). 81% of respondents would like to keep the relative model of determining bag prices, while 20% would like the absolute model. 68% of respondents feel that market prices for event items are appropriate. 15% think prices are too inexpensive (rated 1 or 2), and 17% think prices are too expensive (rated 4 or 5). 45% of respondents did not get all of the prizes they wanted from the event, 35% did get all that they wanted, and 20% got only the items most important to them. 73% of respondents enjoyed or greatly enjoyed the event’s mechanics (rated 4 or 5), 19% were in the middle of the road (rated 3), and 8% did not enjoy the event’s mechanics (rated 1 or 2). 55% of respondents enjoyed or greatly enjoyed the event’s activities (rated 4 or a 5), 21% were in the middle of the road (rated 3), and 25% did not enjoy the event’s activities (rated 1 or 2). 38% of respondents found the event coats applicable and/or inspiring new characters (rated 4 or a 5), 26% were in the middle of the road (rated 3), and 36% did not find them applicable or inspiring new characters (rated 1 or 2). 69% of respondents found the items to be useful (rated 4 or 5), 20% were in the middle of the road (rated 3), and 11% did not find them to be useful (rated 1 or 2). Pets should send words to pets rather than players to pets. Several players made the point that this makes sending words a more in-character experience. We will implement this in the future. Changing lifestyles makes a time-intensive event like this difficult. A fairly common comment was “I used to have time to do these events, but now I don’t.” A lot of players are finding full time jobs now which, although the Scrabble-style event is generally an enjoyable one for our base, it’s harder to get all the prizes which adds some amount of frustration. Fall also tends to be a busy time for students which was another reason noted by some of you for the lack of time to dedicate to this event. The equal probabilities of the items within the bags was generally well-received. We made this change based on player feedback from previous events, and although some of you experienced the evilness of the bags (pulling e.g. four staves in a row), evening out the probabilities was a happy change for many. The bag prices were a deterrent for trying for the coats. For some, the prices were too steep which was a deterrent for trying for some of the event offerings, particularly the event coats. The survey results also show that the coats weren’t inspiring as many character ideas either, which likely also played into this effect. There was a smattering of comments about mechanics that could be tweaked in the future. The ideas that got at least two comments were: Limited letter exchange or altered drop rate of letters, ability to lock letters in the collection bar (when players are saving letters to spell particular words), and adjustment of the time bonus to be more useful. Players like the toggleability and variety of event items. The flexibility of toggleable items makes them popular with players. We also hit some categories on the 2018 Item Survey, which was appreciated as well. Still many fans of the Scrabble-style event. This continues to be a popular event, though we’ve gathered a lot of information about how we can change it in the future to make it more enjoyable! General activity feedback: Many players like the idea of recolors as an activity prize. Many of you commented that you were fond of the recolors, and liked the idea of making recolors as activity prizes. General activity feedback: Many players liked the concept of the activities, but there were various changes that could improve them a lot. Players like the interactivity of the activities, the creativity, and the effort level of the individual requests. However, various aspects about activities made participation difficult and should be considered in the future (more detail about these aspects in comments below). General activity feedback: Deadlines should be consistent and easy to find. Many players found the dates and the deadlines confusing. Players suggested always ending activities on rollover for consistency. General activity feedback: Deadlines should be longer/more flexible. Players found the short windows for Jessamyn and especially Bruc’s activity to be too difficult to keep track of and too short. Players suggested that having just one round with more flexible submission windows would have been easier to fit in and remember. Players liked getting pinged reminders, and would have liked to have been pinged automatically for the second rounds as well. Pings were a bit hairy on our end since they took awhile to compile and we often missed a couple players. If we do pings in the future, finding a way for us to automate this would be necessary. General activity feedback: There were activities? Several players commented that they didn’t realize there were forum activities until later on in the event. Finding a way to better advertise the activities in future events would be helpful. Enchanting Expressions: Wordlist was especially difficult. The length of the words and the letter frequency of the words made it a very difficult activity to complete this year. Paying closer attention to word length and letter distribution in future will help alleviate this issue. There were a lot of instructions for Bruc’s activity which made it confusing and details easy to miss if not read carefully. Some players weren’t sure if they had done the right thing to earn a prize. This was the favorite of the activities because of the lengthier submission window and simpler instructions, though many of you wish this activity had a pinging system as well. Whew! And that’s a wrap! We thank you for taking the time to think about the event and what we can do to make improvements in the future. There were some especially great comments in this feedback round—if you didn’t see your comment referenced here, it’s likely because it wasn’t repeated by others, though that doesn’t mean we won’t take it into account! This new more interactive activity style was an experiment we wanted to try with the fall event, so thank you for being patient with us as we figure out the best way to make it happen. Many of you offered specific ways we can improve on our next attempt, and that is greatly appreciated (and helpful)! I got both a Salt-Kissed Arcane Assortment and Gritty Arcane Assortment. Lycan I will look into it and send you an echo! If anyone else notices a mistake with the prizes, please send an echo to me or Crow. Hope everyone had a nice event user-side and staff-side! On the pinging system: if automation can’t be done yet for whatever reason, one way would be for players to sign up to a ping list and then to just paste that for every event. That way you’ll also be pinged even if you didn’t participate in the last round and it provides an easy way to ping people for new rounds. If admins don’t want to have to manually sift through a forum thread full of requests to be added to the ping list, a submission form can be used for people to submit requests and maintenance will be done from there—or the alternative would be an openly editable doc, though there would then also be a need to monitor to make sure nobody maliciously removes anyone else from the list or something like that. Sylphie We put the auto buy in place a couple years back when we had handfuls of players forgetting to spend any of their tokens—it’s surprising, but there are always a few players with 600+ tokens unspent (I actually forgot to spend my 1000 from this year.. cough…)! I can see how it would be an unpleasant surprise if you were keeping some aside for the raffle though, so we’ll try and come up with a happy middle ground. What a nice surprise, I got a bag! Thank you! It’s nice to read all the feedback and see that some concerns/issues I had were shared (mainly, not having the time for the 15-minute intervals) and that this is being looked at. I did have a thought that I don’t think I placed in the form at the time: What about incorporating site games into events? For example, with a scrabble event like this, Spellstones makes a perfect match. Event tokens could be granted based on cumulative score or score milestones. If the milestone is 1 token per 100 points, the player could obtain x amount of tokens based on the hundreds they make at the end of a game, or they could receive 5 every time they reach 500 points cumulatively, with a potential daily cap on amount of tokens obtainable, or a cap on tokens obtainable per game. Or the reward could be an openable bag containing x amount of letters based on their score; or automatically distributed, with additional letters going into inventory; or simply capped at the amount of letter spaces left on the board. This would allow players to engage more actively in events like this in a more concentrated amount of time. I know some people really don’t like spellstones and item costs would need to be rebalanced, so it’s definitely a rough example, but I think that existing games could be involved in timer events as an additional source of tokens or gatherable items, whether all games are involved in the event or just one per event. Or, with the adventure system, event tokens could potentially be incorporated into that. Congratulations to the winners!!! =) all in all this was a really fun event for me. I especially enjoyed Bruc and Jessamyn’s activities.